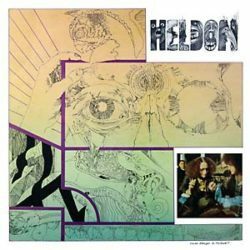 Bureau B present a reissue of Heldon’s debut album Electronique Guerilla, originally released on Disjuncta in 1974. In 1973, 22-year old Richard Pinhas was well on his way to becoming a full-time philosopher. He had almost finished his PhD and begun teaching at the University of Paris. But he also had a hobby: writing music and recording it himself. When he submitted a few tracks to British label E.G. (home of King Crimson and Roxy Music), the imprint was interested, but Pinhas was frustrated to find out he’d have to wait a year for them to release anything. So Pinhas put out his first album on his own label, Disjuncta. He called the project Heldon (from a location in Norman Spinrad’s 1972 sci-fi novel The Iron Dream). It might have been the first self-released rock record in France. “Or at least the first one that worked,” says Pinhas. “It was like a musical and political event in France. Musical because there were few artists using synthesizers here, or even in the world. And political because we tried to say that the big companies make everything bad and their records are too expensive.” Most of Electronique Guerilla was made by Pinhas alone, but “Ouais, Marchais, Mieux Qu’en 68” featured five collaborators, including one of his mentors, Gilles Deleuze. Over winding guitars and pointed percussion, the French philosopher reads lyrics taken from Friedrich Nietzsche’s “The Voyager and His Shadow” (1880). Despite being self-released — with Pinhas himself delivering some stock directly to record stores — Electronique Guerilla quickly sold over 19,000 copies. That convinced Pinhas he should make and release more music by himself — but he would have little time for philosophy. “I had to make a decision, because at that point in France, you couldn’t do two jobs,” he remembers. “So I made this very bad choice to be a rock ‘n’ roll musician.” It’s a choice he’s stuck to for four decades, and the fiery Electronique Guerilla provided a potent spark.